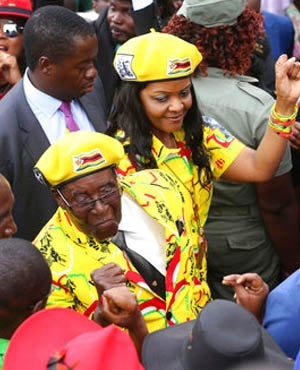 The atmosphere in Zimbabwe is becoming tensed up as four persons were arrested and charged to court for booing Grace Mugabe, wife of 93-year-old President Robert. Grace has expressed her desire to take over from her husband as the next president of Zimbabwe in 2018. Earlier in the week, it was vice president and Mrs Mugabe’s opposition, Emmerson Mnangagwa that was fired from his position after the 52-year-old described him as a snake that "must be hit on the head." According to prosecutor, Jerry Mutsindikwa, the four arrested persons, three men and one woman, allegedly sang the song 'into oyenzayo siyayizonda'" - the lyrics of which say "we hate what you are doing" in Ndebele - while Mrs Mugabe addressed a rally on Saturday. The quartet, who are supporters of Mnangagwa, are being charged for undermining the president's authority.